You are now eligible for Free Shipping! Véronneau’s exclusive collection of mirrors comes in all types: round, square, rectangular, framed and non-framed, bevelled and non-bevelled. 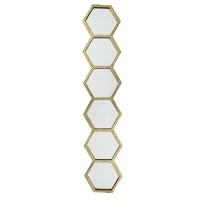 Choose from among layered mirrors, mirrors with wood inserts or ones with metal framing. They’re great for any space, like the entrance, bathroom, living room or dining room, and can be displayed as a decorative accent or a traditional functional piece. You’re sure to find the perfect fit!